There are a variety of both practical and technical considerations to take into consideration while advancing power resiliency through microgrids. But you know what’s even more expensive than advancement? Power disruptions. In fact, according to Eaton’s Blackout Tracker Annual Report, electric outages cost the economy $150 billion annually and impact approximately 14.2 million people. Making Microgrids Work, an educational white paper on advanced power resiliency. Get it Now. And these numbers are expected to climb with today’s higher risk of natural disaster and super storms. Microgrids have become part of the answer to these concerns and more. 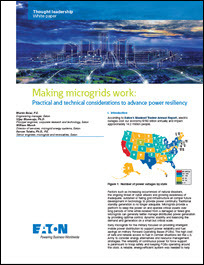 A recent white paper from Eaton, “Making Microgrids Work: Practical and Technical Considerations to Advance Power Resiliency,” highlights how microgrids can provide a platform to keep the power on and operate critical assets while staying isolated from a damaged or failed grid. This makes microgrids’ “islanding” function one of their most important assets. Eaton’s report provides a basic survey of current migrogrid technology, including its barriers, benefits and application areas. 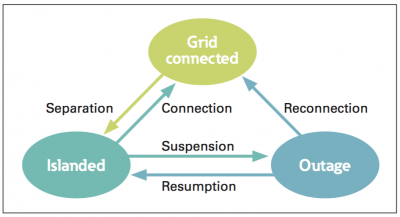 To better understand microgrids’ importance to modern energy efficiency efforts, one must become familiar with a basic group of vernacular, such as normal grid connected operation, islander operation and outage mode. These terms describe the different microgrid system operating modes. So, when are microgrids considered for applications? In the U.S. specifically, microgrids are used in a variety of circumstances, such as community microgrids in weather disaster-prone areas, rural and remote areas, and areas where electricity is prohibitively expensive, to name a few. Although microgrids can be the answer to many modern electricity challenges, a wide range of questions can arise while exploring microgrid sizing and design options. According to the Eaton report, no one-size solution can fit all circumstances. Instead, a “feasibility study” is used to identify and design the microgrid project for optimal technical features and economic return. Let’s say the feasibility site results show a microgrid is a viable option for your project – then how can you be sure the microgrid will perform as intended before going ahead with the plan? That’s where a virtual microgrid comes in. Virtual microgrids, or hardware-in-the-loop simulations of complex microgrid systems, allow owners and designers to understand the system as if the assets and devices were already connected. Virtual microgrids, or hardware-in-the-loop simulations of complex microgrid systems, allow owners and designers to understand the system as if the assets and devices were already connected. Then once the microgrid project is planned out, owers must learn how to use a microgrid system controller. This controller can cut down on engineering costs, especially when a virtual microgrid has been used to provide early system insights. Your last step? 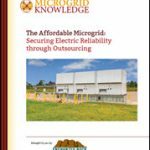 Finding a qualified microgrid supplier that fits the bill. For a more in-depth look at the road to microgrid installation, download the full whitepaper, “Making Microgrids Work: Practical and Technical Considerations to Advance Power Resiliency,” free of charge, courtesy of Eaton.